The Best Preview Render button will render any model in edit mode with real 3D Shadows, 3D Fibers, Ambient Occlusion, Transparent Subtools, or with HD Geometry. BPR will also work with Depth Cue and Fog. If you wish to use BPR with the Movie Palette>Turntable button the BPR render must be completed before clicking the Turntable button. This is also true if BPR is to be used with the Timeline Movie Recording. Some materials effects require the use of Best render. To use Best render with BPR, render with Best render first, then BPR. SubPixel Anti-aliasing Render Quality. The SPix slider controls the quality of the anti-aliasing: The higher the value the better the quality but the longer the image will take to render. Set the slider to 0 for no anti-aliasing and quickest render time – this is useful when trying out other effects. A positive SubPixel Sharpness slider setting increases the sharpness of anti-aliasing. A negative value gives a softer, more blurred anti-aliasing. The default is 0. The View Blur Radius slider adjust the View Blur. Higher values give increased blur. Shaded image from most recent BPR render. The background will be black and the edge of the model without antialiasing so as to provide the best results when compositing. Click the thumbnail to export to a file on disk. Depth Map from most recent BPR render. Click the thumbnail to export to a file on disk. Shadow Map from most recent BPR render. Shadows must be turned on in the Render Properties menu. Click the thumbnail to export to a file on disk. Ambient Occlusion Map from most recent BPR render. Ambient Occlusion must be turned on in the Render Properties menu. Click the thumbnail to export to a file on disk. Mask Map from most recent BPR render. Click the thumbnail to export to a file on disk. Sub-surface Scattering Map from most recent BPR render. Click the thumbnail to export to a file on disk. Floor Depth Map from most recent BPR render. Click the thumbnail to export to a file on disk. 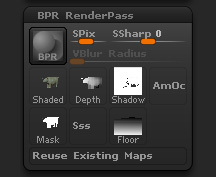 With this option turned on and if the model has not been moved, the next BPR renders will re-use shadow, ambient occlusion and sub-surface scattering maps, saving on render time.